Script your Microsoft SQL Server tables content into a valid SQL script. 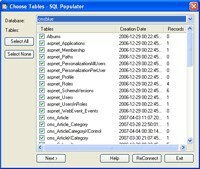 SQL Populator 1.0 is databases & tools software developed by Software Development Innovations. SQL Populator is a handy yet powerful tool to script your Microsoft SQL Server tables data into a valid SQL script. With a wizard-like interface you can easily setup script generator for your personal needs to clear tables before inserting data, or run script as single transaction or even generate a .bat file to run your script. SQL Populator allows you to append generated scripts to a script created by Microsoft SQL Server facilities, etc. business software is demo, which means you can download and use this limited edition of SQL Populator 1.0 for free. To use full version of SQL Populator 1.0 you have to buy the databases & tools product for $39.95. SQL Populator 1.0 is available at regnow and Software Development Innovations website. SQL Populator 1.0 supports English interface languages and works with Windows XP/Vista. Latest SQL Populator 1.0 does not contain any spyware and/or advertise modules, allowing installing it with no worries concerning valuable information loss. Our website has thoroughly tested business product SQL Populator 1.0, written the review and uploaded installation file (517K) to our fast server. Downloading SQL Populator 1.0 will take several seconds if you use fast ADSL connection. Add text and pictures to existing pdf files with the help of a script language.